This bit from Lorina is ideal for a rider using a strong bit for the first time, as the action is milder than other Pelham Bits. The mouthpiece is made from a flexible polyurethane material which eliminates the nutcracker effect and is more comfortable. 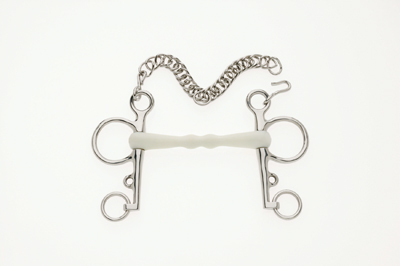 Despite this, the curb chain and reins can be used to provide the strong control of a Pelham Bit. There are currently no questions for Lorina Flexi Mullen Mouth Pelham - be the first to ask one!